More Tog Trips Up Top - (even an UnAmerican Trip!) - Then below: Blackfishing Made Incredible? For How The Rail's Laid Out..
Tog trips thus far were hardly world class affairs. Our Tog Pool Is By Length: A Tog That's Been Released Counts The Same As One In The Boat. Rental Rods are $7.00.. Each A Rod I'd Use Myself. Wear Boots! Sneakers this time of year can ruin your trip. In winter waterproof boots are almost a necessity - sneakers can ruin your day. While some rarely, or never, wear gloves for fishing, you'd not likely see me fishing this time of year w/o at least the half-finger wool gloves. Tuck a "hot hands" warmer in the palm and life is good..Layers are best because, believe it or not, sometimes it can be very pleasant offshore--especially when the wind lays down. In winter it's warmer offshore owing to warmer waters. In summer it's cooler..
24,000 Reef Blocks have been deployed at numerous sites. (plus three much more normal trips!) we had 5 days of wind. Only had an easterly for about 12 hours, but the swell began sooner & lasted far longer. Left the dock Friday after that blow thinking the bottom would have been unaffected with such a short easterly. By day’s end we’d only caught 5 throwbacks in as many spots - a keeper skunk! Happens. I’ve seen worse. This fishery is for the passionate.. It must have been enough east swell to roil the bottom - to stir up layers of dead algae which obscure light & scent in the bottom layer of our ocean.. I call it ‘black water’ - it’s getting worse, not better. And this event so very minor; after a truly tremendous blow the bottom can be dark for weeks.. Frequent readers will know I believe the only way to fix our black water situation is to restore our estuaries’ oysters in amazing number. With each bivalve capable of filtering/straining up to 50 gallons of water a day, they’re our best shot at controlling over nutrification & resulting algae that today darken the Mid-Atlantic’s marine waters. Saturday we began with three whales. Never did get close enough for a positive ID, but I thought them humpbacks by their behavior. Anchored atop a piece where clients have caught many tog over the decades - even 4 at 19 pounds - and caught just one tog, a fourteen pounder. Left that and tried a little deeper, over 90 feet, and found a sweet pick of double digit tog that soon sputtered.. A few nice fish on an otherwise slow day. Sunday, however, that sweet pick stayed almost all day. Almost. ..and never backed the pressure off. No creel limit, no size limit. Over the rail, into a pail. Pressure stayed there too. Didn't bleed them. Didn't ice them. Took pics & ate them. When our tog fishing quickly died we couldn't blame trappers, trawlers; no hurricanne - was us. We wiped out the tog on those wrecks/reefs..Completely. I was working deck then. Even built a gaff with a hook on each side to gaff doubles. (Yeah, that didn't work. As soon as you stroke the second one, the first pops right off..) In the 35 years since I've done all I can to make our toggin sustainable; am certain we can leave it better than we found it. Again, the main thing would be easing pressure on tog by increasing pressure on sea bass. Equally important is reef construction. Every reef we build becomes colonized by tog after 3, sometimes 4 years. They’re spawning hard as they can to increase their population..
Our nations best funded fisheries management is in Alaska. There habitat fidelity (natal fidelity) in salmon is so important each river has separate regulation. Maybe one day we'll make tog the fishery it could be. I know what my clients want to catch! NOAA: 'See them MRIP recreational catch estimate numbers right there Mr. Fishery Manager? Don’t matter if no one believes it. Thats what those boys caught & That's overfishing. Only thing you need to fix. The predecessor to MRIP's recreational catch estimates had to be repaired. With this "Vastly Improved" catch data supposed to be in place swiftly, managers would have to enforce "Accountability Measures" or AMs..
From then on if we go over our "Recreational Harvest Limit" (RHL - a quota by any other name..) then we must Pay Back that overage in subsequent years via AMs via much stricter regs or closure. The repair to MuRFSS was MRIP. It came out in 2012. Accountability Measures began in 2009. The year sea bass were closed by 'emergency' because MuRFFS showed us far over quota. Perfect. Not only was MRIP far too late to save us from AMs, it stunk too. From 1981 to 2015 New York's Private Boats are said to have landed 1.2 million pounds of sea bass during Nov/Dec -- that’s 1.2 million pounds across ALL of those 34 years combined - much of it wholly unregulated. Men factually fishing that time of year, Party/Charter operators, they did not notice Private Boats in such profusion that they were suddenly catching 120 pounds of sea bass to each pound For-Hire clients caught. In fact, they report seeing very few Private Boats during Nov/Dec in the offshore sea bass fishery. It's COMPLETELY cooked up. Absolutely garbage. This is EXACTLY how recreational harvest limits are exceeded - We blow through our quota, not with actual fish thrown on a dock, but with wildly inaccurate guesses of catch ..that are some- how not scientifically supportable. 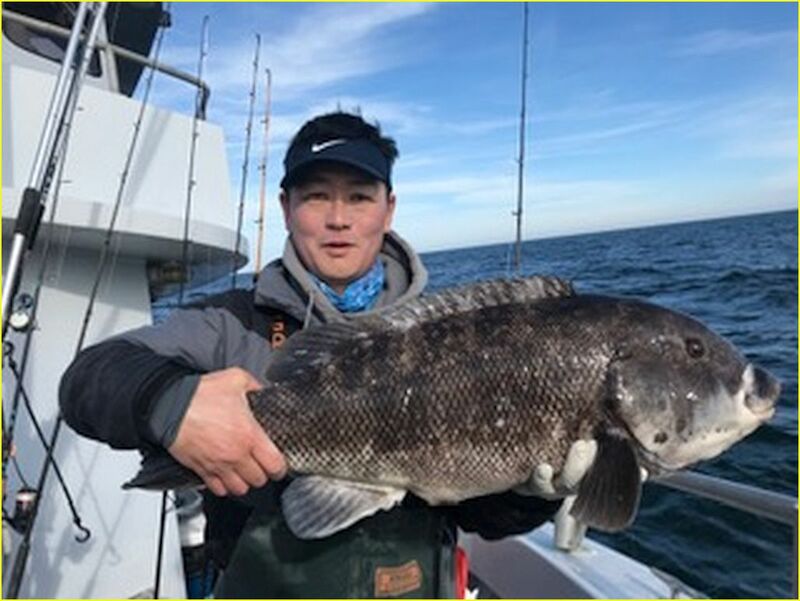 MRIP shows Massachusetts' Private Boats landed 5.6 pounds of sea bass for every pound caught by ALL Party/Charter from Cape Hatteras north in May/June.. When I've spoken/written with skippers up that way they seem to think Party/Charter might get out fished a bit on Saturdays, but during the week? No. Sakes - I know there’s some money up that way. I’ve heard if you flip a quarter in the air in Cape Cod, it’ll come me down a half dollar; but dang: Does Everyone up there have a Boat? Do Party/ Charter operators suffer because so many anglers own their own rig that For-Hire services are unneeded? If a party boat and 3 charters are fishing a large area of natural rock bottom and catching very well, and if the Party Boat has 75 aboard plus the 3 charters’ 18 souls — then there must be an accompanying fleet of 361 Private Boats Fishing to even-up MRIP’s assertion. (93 Party/Charter clients on one day X 13.6 = 1,265 Private Boat anglers that same day.. I know folks who enjoy Massachusetts' nearshore sea bass fishery on charter boats - a blast on light tackle with jigs. Yet fishing pressure is never described this way -- where an enormous number of Private Boats exist for each Charter or Party boat. Ought to be easily supported by observation of those who are out most often, especially For-Hire Party/Charter skippers who need to understand fishing pressure on each area of reef-like bottom if they are to consistently catch sea bass for clients. In my queries no one is seeing boats on the water to equal MRIP’s assertions of Private Boat catch. Summer flounder, scup, red snapper, cod, haddock - doesn’t matter. All recreational species have these statistical spikes in them. I’ve detailed them for years & years. There is quite a bit written about recreational data in the new "Modern Fish Act" that recently became law. I asked readers to write their DC Reps many times over the last few years - to comment on the new legislation. It was ALWAYS about our catch data. Now to see if we've gotten through. On the other side, however, MRIP's creators are positively CONVINCED they're STILL underestimating recreational catch. That’s what they’re telling Congress. If management does as it always has, they'll average Nov/Dec from the last couple years to estimate 2018's landings - especially because the gov shutdown must have MRIP backed up. Should be about 11 or 12 million pounds in 2018 -- we’ll be WAY over quota. And not a bit of it true. Today we have the harshest regulations ever on sea bass, yet MRIP sees overfishing everywhere it looks. Except Party/Charter. When regs tighten, our catch drops. It should. Inexplicably - Private Boat Catch often explodes when regs tighten..
We need to devise truly accurate Party/Charter estimates. And No, even though we tell NOAA what we've caught everyday by filling out an electronic “Vessel Trip Report” they've not a very firm grasp of For-Hire catch either. Sit down with folks who go fishing a lot and you’ll pretty quickly devise "Percentages of the Fishery"
For instance, where Party/Charter and highliner Private Boaters think a state's sea bass catch is 60% For-Hire & 40% Private Boat - then a firm Party/Charter estimate will give managers a much more accurate Private Boat catch estimate. With a fair percentage split agreed upon by those engaged in the fishing, it's simple math to devise the entire recreational catch if one side is a known value. Then we can move on to daily reporting for Private Boats too if we must. We really don't need that much accuracy though. We absolutely need to get rid of estimates that could not possibly be true. It distracts the entire process. A bit of winter tog fishing for now. See if my clients can outfish Massachusetts Private Boats recent 1.6 million pounds of tog. Shoot, maybe we can catch that in one day!